I couldn’t leave. Everyone was gone except for the burn boss, Don Dane, who would maintain an all-night vigil. The sun had set and it was a moonless night. I walked the cut-off trail in the dark for the first time; my path illuminated by glowing snags and the embers from numerous brush piles. What a day it had been! We burned the Scuppernong and I wanted to savor the feeling, the smells, the smoke, the trees, and the night sky. The day, May 6, began as the forces gathered at Forest Headquarters in front of the maintenance shop. 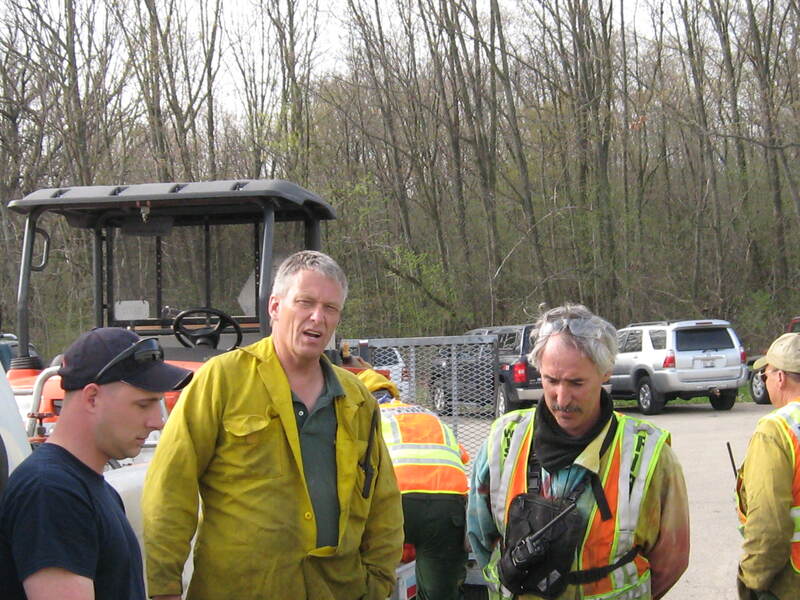 Paul Sandgren and Don Dane discussing plans with the lieutenant from the Eagle Fire Dept. 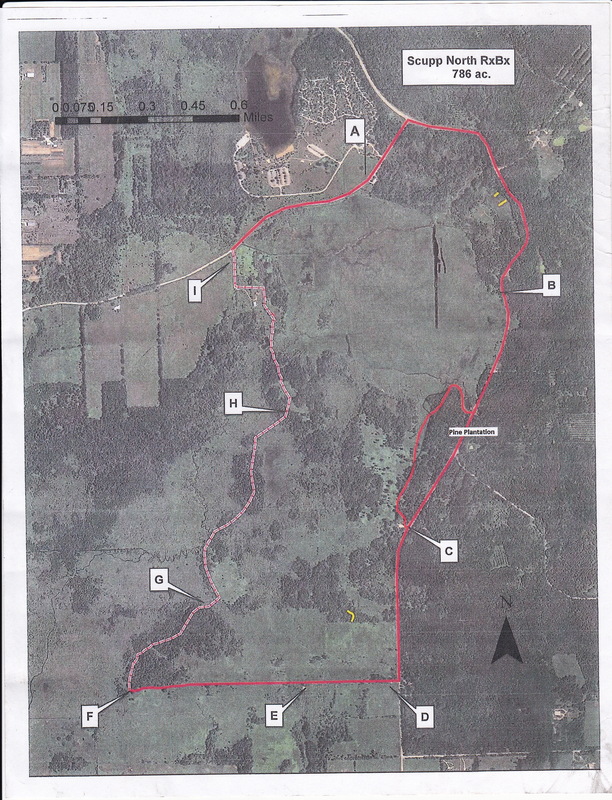 The excitement was building as Don prepared to explain the plan to burn 786 acres of the Scuppernong. Refer to the plan below as you listen to Don’s instructions in the following video and notice that Amanda Prange is the one who steps forward when Don asks for a volunteer for a tough assignment. 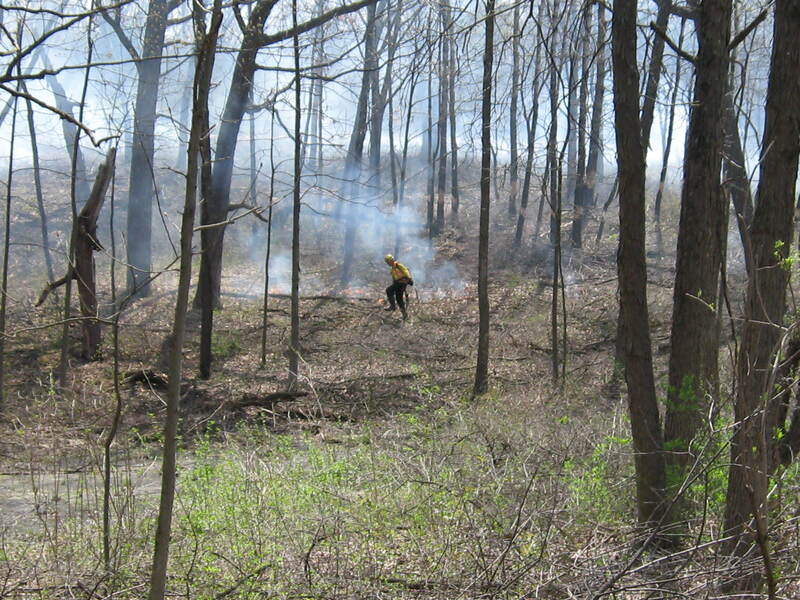 “Go Big” is the trend now for prescribed burns and Don effectively integrated people and equipment from multiple sources to implement his carefully conceived burn plan. Lindsay and I were assigned to line boss Paul Sandgren’s team along with IAT trail boss Pat Witkowski, DNR sheriff Elias Wilson and Rocky, Dan and Melanie, also from the DNR. 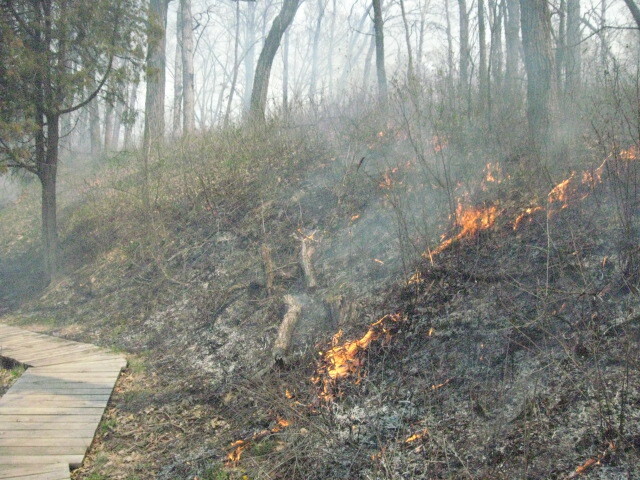 Our job was to make sure the fires set at the top of the ridge along Hwy 67 did not jump the trail. The shifting and variable winds did not conform to the expectations in Don’s plan and Paul and Don decided to light the hillside along Hwy 67 from the bottom up instead of the top down, which was very effective. I was assigned to help in this task and grabbed the last drip torch. Unfortunately, the seal around the throat of the torch was not good and fuel leaked from the rim in addition to coming out the torch nozzle. It is a good thing that Elias was there as he immediately noticed the danger and gently persuaded me to stop. I am prone to momentary lapses of reason and common sense when fixated on a goal, and it is quite likely that I would have immolated myself and ruined the day if Elias had not been there. We listened to our radios with great interest to the status reports coming in from all quarters and I was impressed by the calm and deliberate way that every issue was handled. Incredibly, “the feds” as Don described them, called just as we were getting under way and tried to shut down the burn. 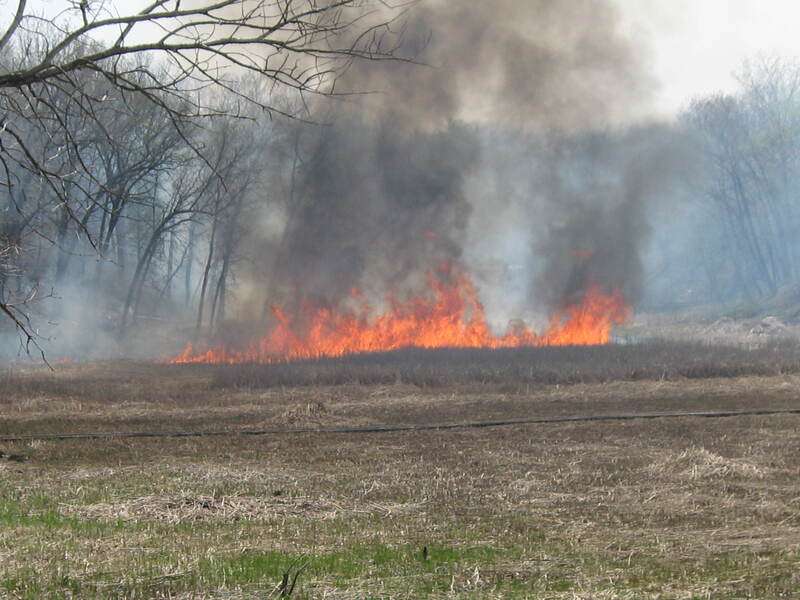 They asserted that the WDNR was using funds from the NAWCA grant to pay for the effort, when in fact this burn had been planned for months before the WDNR was even awarded the grant and no money from the grant was used for the project. Don negotiated with “the feds” and resolved the issue. 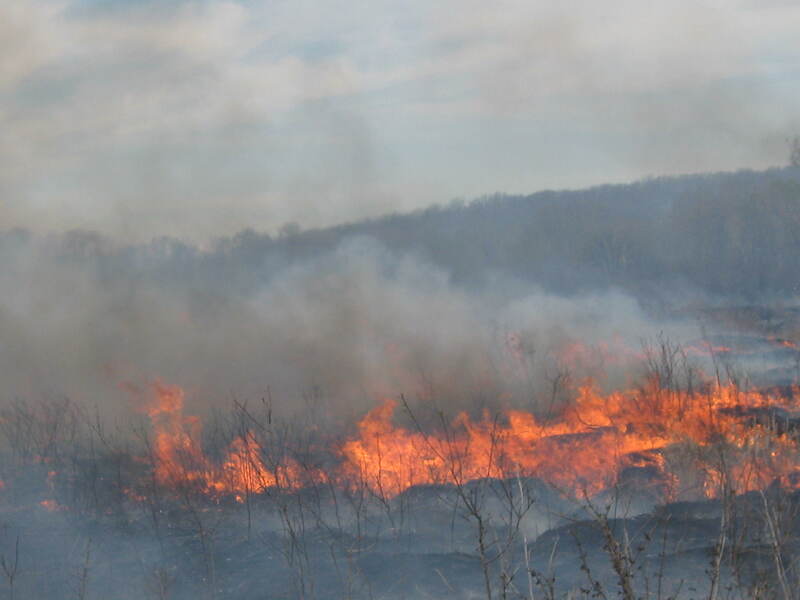 After the hillside was burned we proceeded to light the valley on the east side of the Scuppernong River. 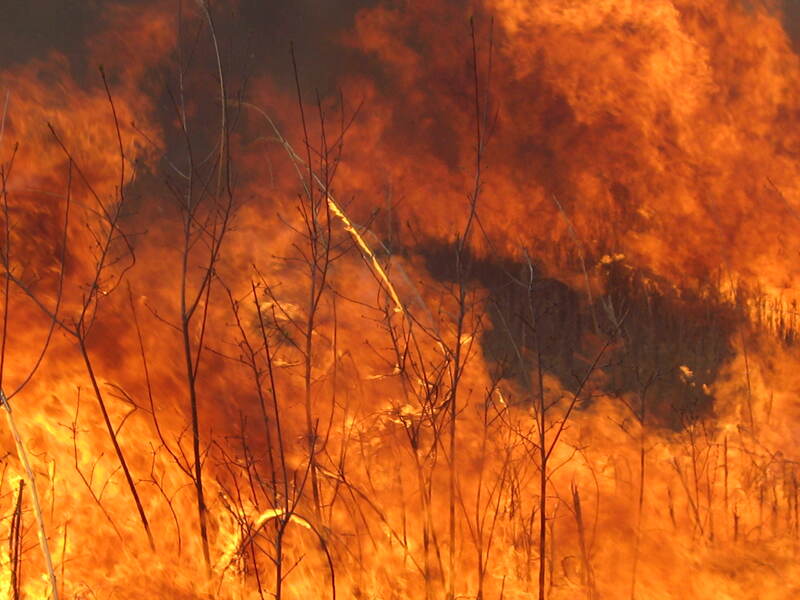 Check out this head fire and notice that it is running from south to north. 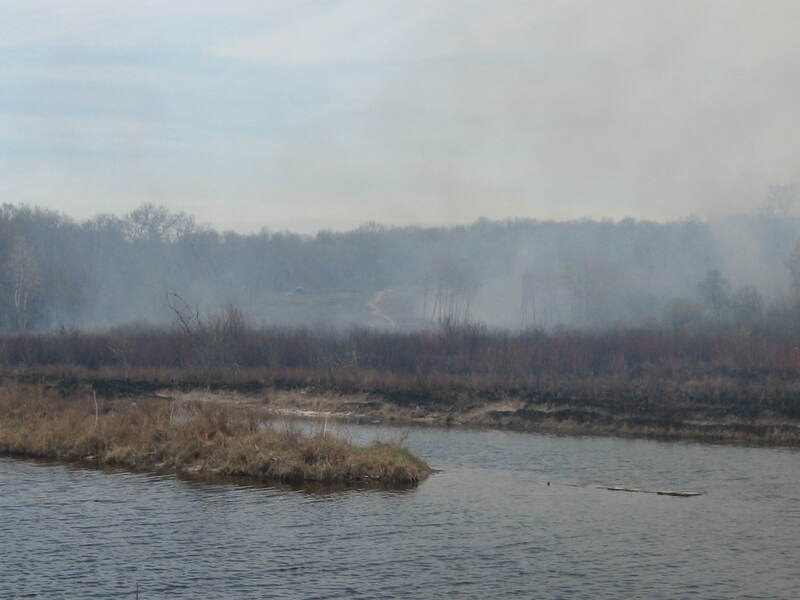 We took a very short break for lunch and lit the west side of Scuppernong River. 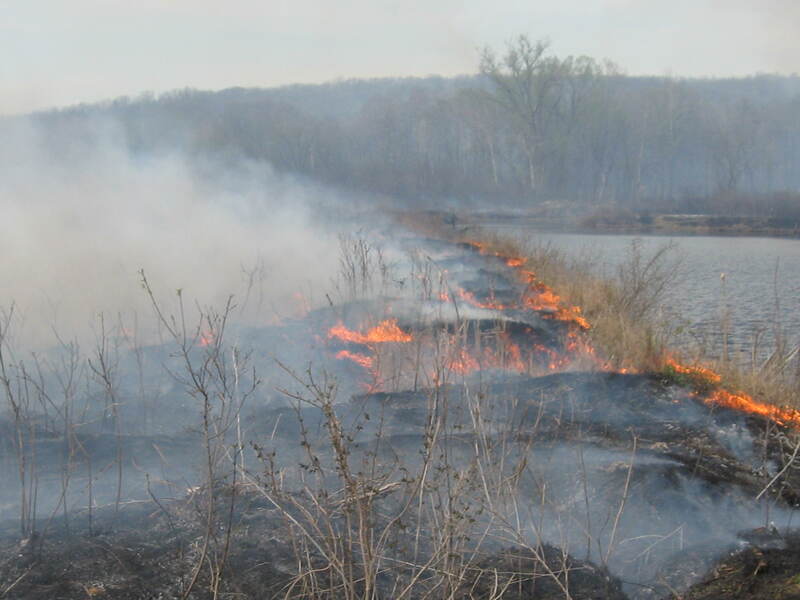 I had a good working torch by now and walked along the west edge of the river igniting an incredible head fire that ran to the tree line on the west bank of the bowl that used to form the lower pond. 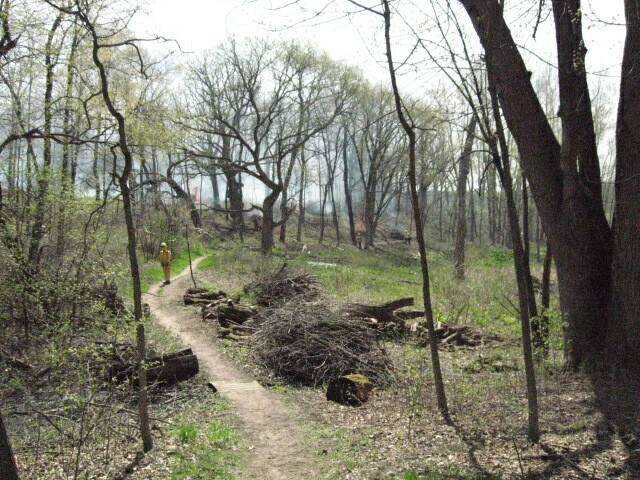 All the burn teams were making great progress and we heard reports of all the burn lines being “tied in”. The perimeter was secured and the teams began pushing head fires through the interior of the burn unit. I walked along the north side of the river, where it makes its turn west from the old barn site, taking soakers in both boots as I lit the bank of the river all the way to the bridge where the stream gaging station is. 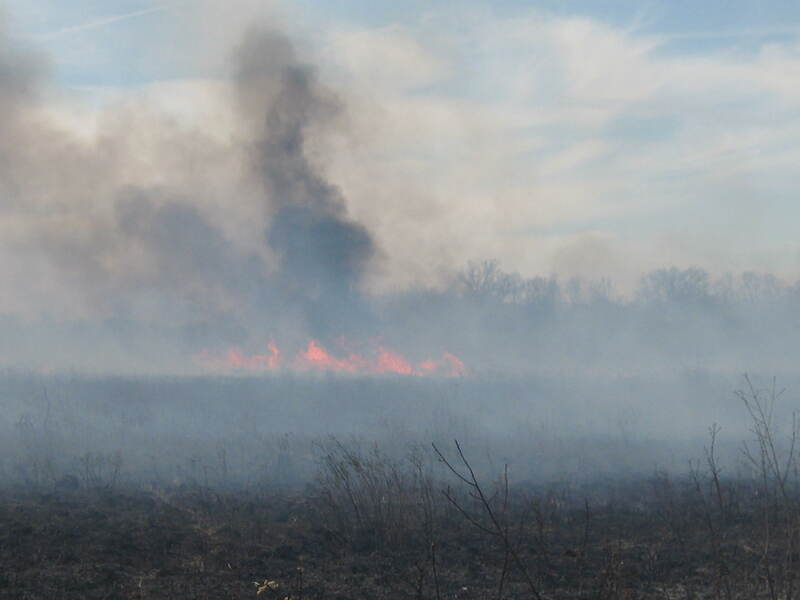 The winds where blowing from the south and this line of fire moved aggressively to the north jumping the cut-off trail. Lindsay moved into the black behind the line of fire and put out flames in a huge oak tree that is laying sideways around 10-12′ off the ground saving this interesting landmark. 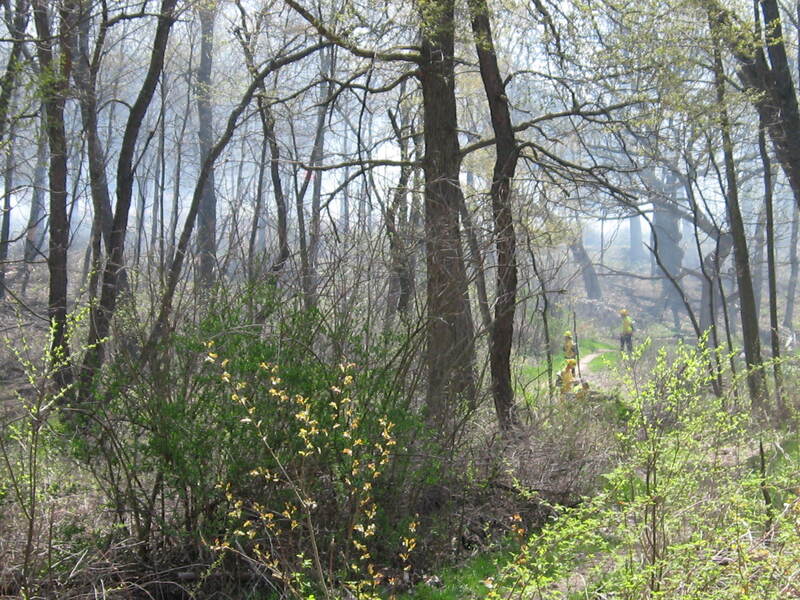 Paul Sandgren sent me over to light the area on the west side of the marl pits on both the north and south sides of the river. The backing fires lit on the west side of the burn unit were creeping east and the time was ripe to drive a head fire towards them. 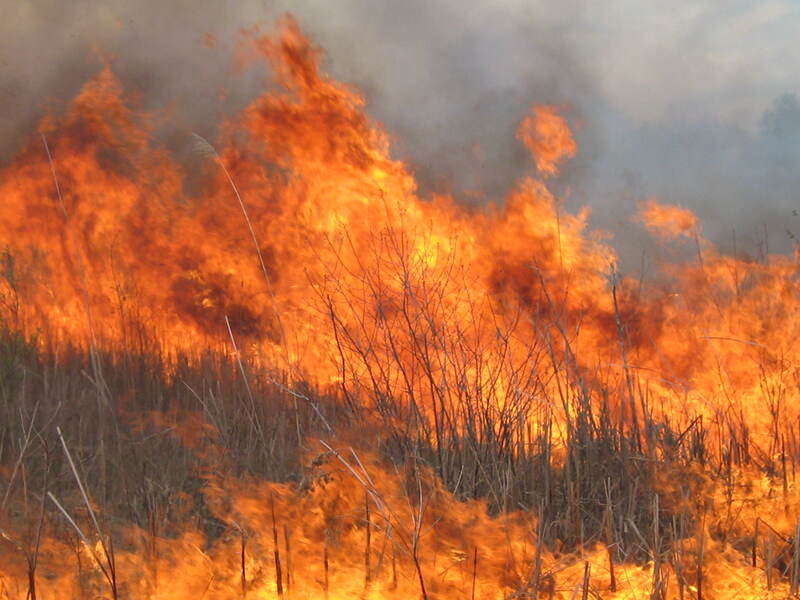 I had just leveraged a south wind to light the north side of the Scuppernong River and now, out in the open, I had a strong east north-east wind behind me. When I got to the marl pit bridge I found the southeast corner on fire and had to dip my water bottle in the river repeatedly to put it out before any major damage was done. 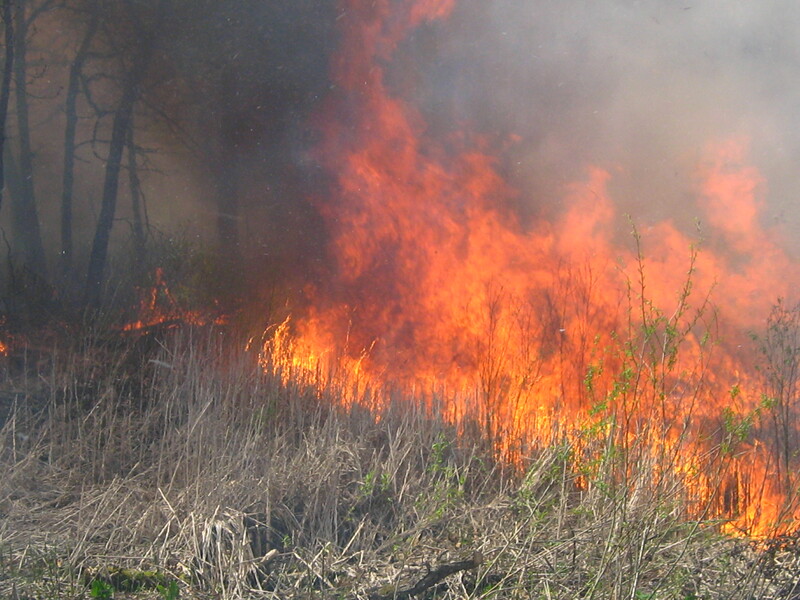 As I walked south along the west side of the marl pits, I lit what soon turned into a raging head fire. 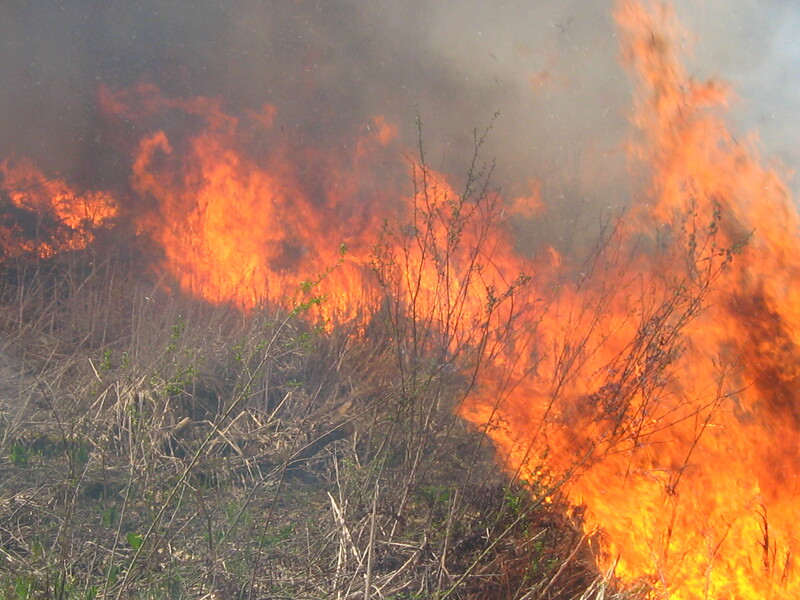 My escape route ahead of me was to simply jump the fire line of the creeping back fire. Here is a perspective looking northeast from marl pit. 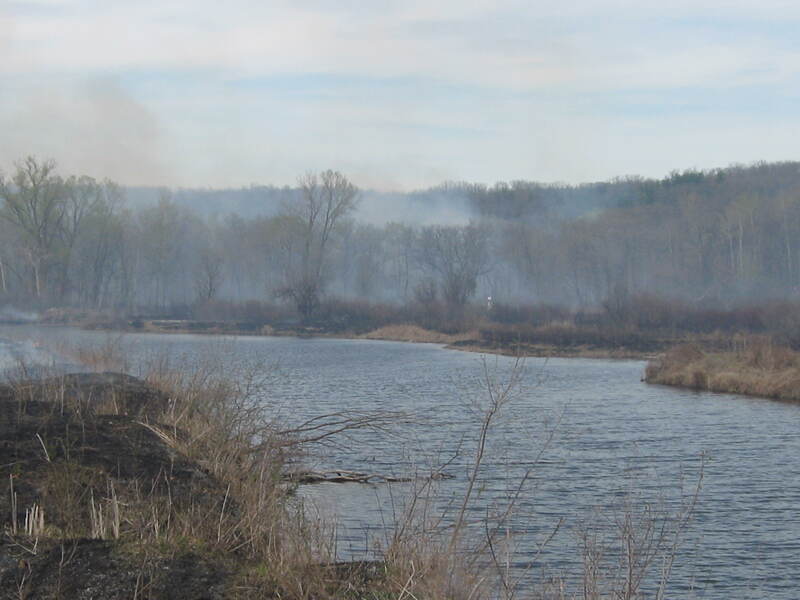 I was able to get a good head fire going on the north side of the river as well and we tried to run it as far as we could along the south side of the trail leading back to the parking lot on Hwy ZZ. 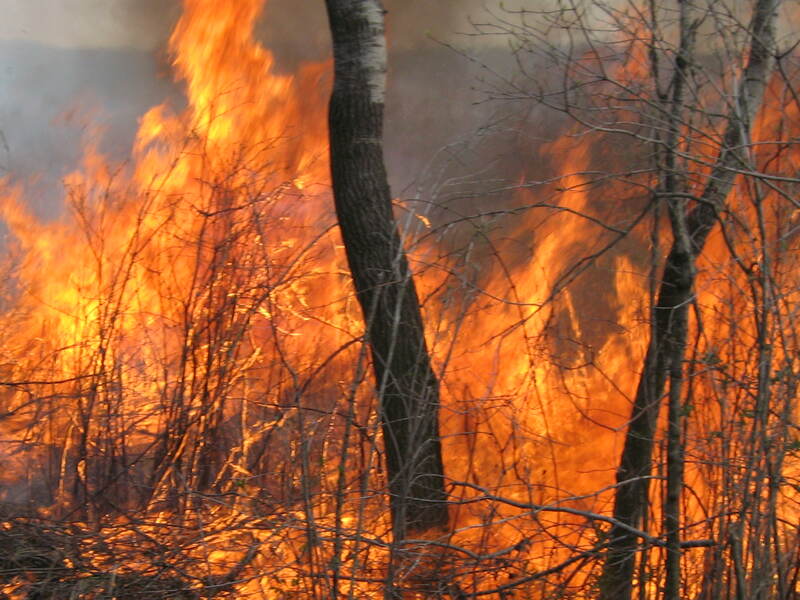 I think we burned approximately 95% of the unit, but Don might have a more precise estimate, and, much to my surprise, we lit all of the 50+ brush piles created since the end of the winter burning season. I am heading out to The Springs tomorrow and I plan to take a lot of “after” pictures to pair up with all of the “before” shots I took yesterday morning before joining the team at forest headquarters. This was an experience I will never forget. 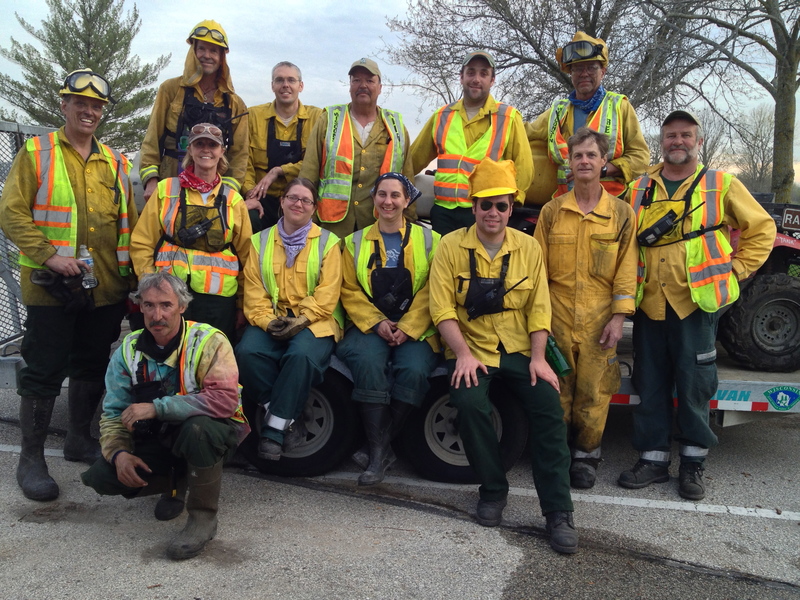 The WDNR team of the Southern Unit of the State Forest led by Superintendent Paul Sandgren, Assistant Superintendent Anne Korman and burn boss, Don Dane, is one of the finest groups of people I have ever had the pleasure to work with. I stopped at The Springs on my way back from Forest Headquarters; I didn’t want to go home. Wandering the trails in the dark amongst the scattered, glowing fires was pure pleasure. I stopped at one of the bogs to capture the sound of the frogs with the glowing embers of a brush pile in front of me. I arrived at the DNR parking area at ZZ & 67 above the Hotel Spring for a sympathetically synchronous rendezvous with Don Dane and we celebrated the success of the burn. There was a lot of mop up work waiting for his team today. I hope you got some sleep Don. 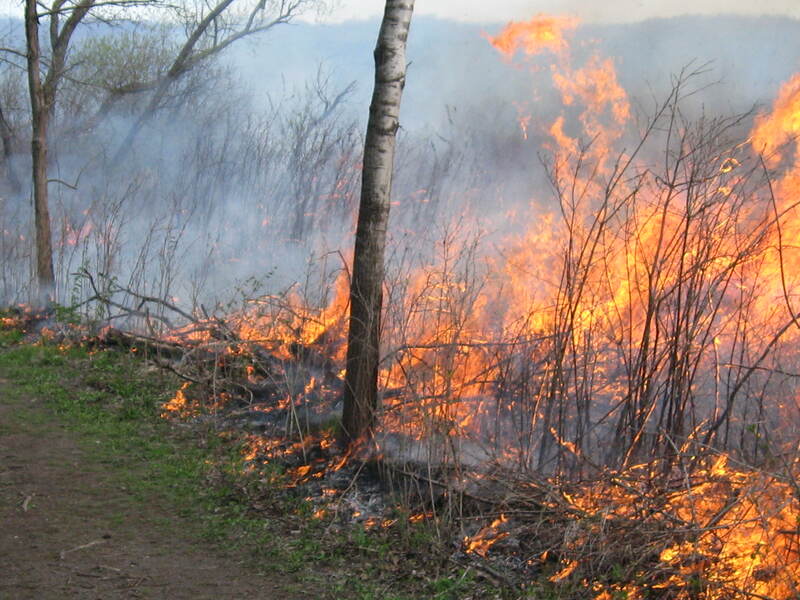 This entry was posted in Brush Pile Burning, prescribed burn and tagged Brush Pile Burning, Kettle Moraine State Forest, Kettle Moraine Trails, Nature, prescribed burn, Scuppernong River, Scuppernong Springs, SouthEastern Wisconsin Hiking Trails by paulmozina. Bookmark the permalink. AWESOME!!!!!! What wonderful coverage of this big burn! Thanks Paul – was thinking of y’all that day. Anxious to go check out the area now! Wanted to tell you I got inspired by the aspen girdling work I did with you & Rich – I’ve started girdling some of my box elders!! What works well for me to strip the bark is a painting tool – 5 in 1 scraper. Might be handy for you too! Unfortunately, I won’t be coming to volunteer on Saturday, the 11th. Prior committment – Juvenile Diabetes Walk with my cousins in Green Bay. Next time! Mega beautiful burn and record of it by you, the poet laureate of Scuppernong. I am so wishing to be involved but need that class. Hope Anne can arrange one at forest headquarters soon. Glad I got up to the Springs before the burn. Can’t imagine any wildlife there now other than birds. Hopefully too many didn’t lose their lives.